CENT17-1T2 FDC CANADA "1917-2017 Centenary Battle of Vimy Ridge in France / Arras"
CENT17-1T1 : FDC First Day CANADA "Centenary of the BATTLE OF VIMY RIDGE (Arras, France)"
Illustration (TYPE2) “Theater of the greatest success of the battle of Arras (France) / trenches of war." CENT16-1 : 2016 - Maxi-FDC FRANCE "Centenary Battle of Verdun / Fort of Douaumont"
CENT16-2 : 2016 - Maxi-FDC FRANCE "Centenary Battle of Verdun / Fort of Vaux"
CENT16-1/5N : 2016 France Set of 5 LISA labels "100. 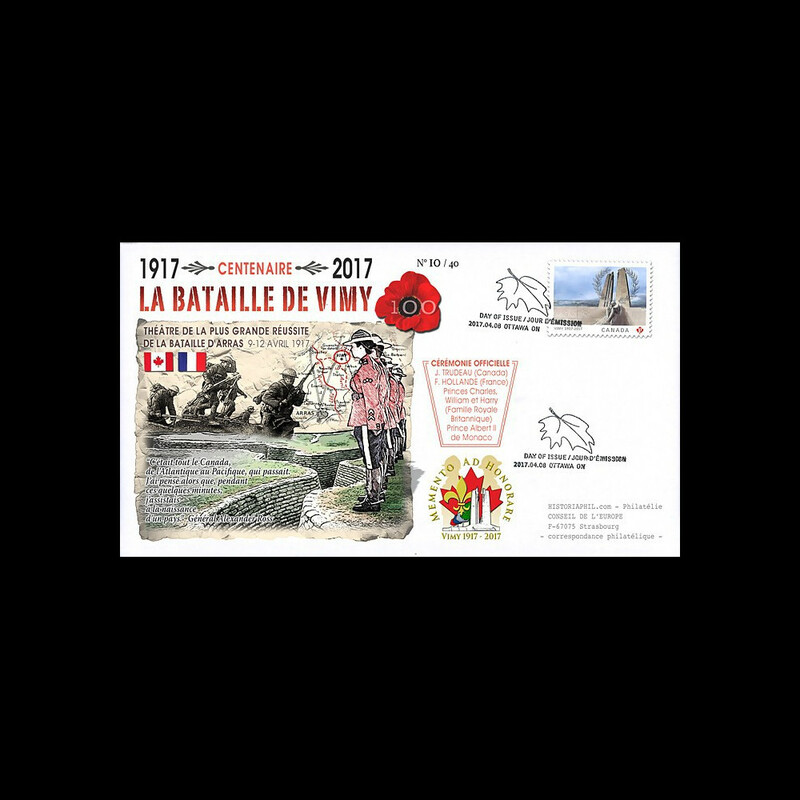 Verdun / Forts of Douaumont & Vaux"
CENT17-1T1 FDC CANADA "1917-2017 Centenary Battle of Vimy Ridge in France / Arras"
CENT17-2 : MAXI-FDC CANADA-FRANCE "1917-2017 Battle of Vimy Ridge in France / Arras"
CENT17-3 : MAXI-FDC FRANCE-CANADA "1917-2017 Battle of Vimy Ridge in France / Arras"